"Edenton" redirects here. For other uses, see Edenton (disambiguation). Edenton is a town in and the county seat of Chowan County, North Carolina, United States, on Albemarle Sound. The population was 5,004 at the 2010 census. Edenton is located in North Carolina's Inner Banks region. In recent years Edenton has become a popular retirement location and a destination for heritage tourism. Edenton was the birthplace of Harriet Ann Jacobs, an enslaved African American who escaped and fled to the North. She became a writer and spoke publicly as an abolitionist. Her memoir, a slave narrative published under a pen name of Linda Brent, was entitled Incidents in the Life of a Slave Girl (1861). In 1658 adventurers from the Jamestown area drifted through the wilderness from Virginia and found a location on the bank 36°02′38″N 76°36′47″W﻿ / ﻿36.044°N 76.613°W﻿ / 36.044; -76.613 of a natural harbor, the site of present-day Edenton. Edenton Colony was the first permanent European settlement in what is now the state of North Carolina. 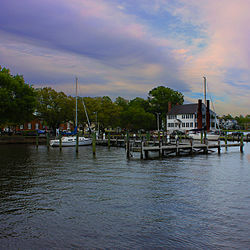 Edenton was established in 1712 as "the Towne on Queen Anne's Creek". It was later known as "Ye Towne on Mattercommack Creek" and still later as "the Port of Roanoke". It was renamed "Edenton" and incorporated in 1722 in honor of Governor Charles Eden who had died that year. 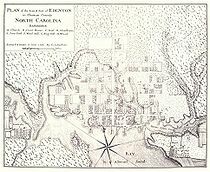 Edenton served as the second capital of the Province of North Carolina, from 1722 to 1743, with the governor establishing his residence there and the population increasing during that period. This town is Situated on the north side of Albermarle Sound which is there about 5 miles over. A Dirty Slash runs all along the Back of it, which in the Summer is a foul annoyance, and furnishes abundance of that Carolina plague, musquetas. There may be 40 or 50 Houses, most of them Small, built without Expense. A Citizen here is counted Extravagant, if he has Ambition enough to aspire to a Brick-chimney. Justice herself is but indifferently Lodged, the Court-House having much the Air of a Common Tobacco-House. I believe this is the only metropolis in the Christian or Mohametan world where there is neither Church, Chapel, Mosque, Synagogue, nor any other Place of Publick Worship of any Sect or Religion whatsoever. What little Devotion there may be is much more private than their vices. A landmark in women's history occurred in Edenton in 1774. Fifty-one women in Edenton, led by Penelope Barker, signed a protest petition agreeing to boycott English tea and other products, in what became known, decades later, as the Edenton Tea Party. The Edenton Tea Party is the first known political action by women in the British American colonies. In fact it so shocked London that newspapers published etchings depicting the women as uncontrollable. Her home, the Barker House, is open seven days a week, without a fee, and is considered by many as Edenton's living room. Joseph Hewes, a resident of Edenton and successful owner of a merchant marine fleet, was appointed the first Secretary of the Navy in 1776. John Adams said that Hewes "laid the foundation, the cornerstone of the American Navy." Hewes also signed the United States Declaration of Independence. James Iredell, also of Edenton, was at 38 the youngest member of the first United States Supreme Court. He was appointed by George Washington. His son James Iredell, Jr., served as the Democratic-Republican governor of North Carolina and then became a United States senator. His home may be toured through the Historic Edenton Visitors Center. Easy sea access halted with a 1795 hurricane which silted Roanoke Inlet. Completion of the 1805 Dismal Swamp Canal took business elsewhere by diverting shipping to Norfolk, Virginia. Locals rejected construction of a railroad, a lack that impeded the local economy. Supreme Court Justice James Wilson, a signer of both the Declaration of Independence and the United States Constitution, died in Edenton on August 21, 1798, at age 55, while riding his judicial circuit. In 1862, during the Civil War, the Albemarle Artillery was recruited at Edenton by a local attorney named William Badham, Jr. Its guns were cast from bronze bells taken from courthouse and churches in the Edenton area. Known as the Edenton Bell Battery, its four howitzers were named the Columbia, St. Paul, Fannie Roulac, and Edenton. Two of the guns, the St. Paul and Edenton, have been returned to Edenton and can now be seen at Edenton's waterfront park. Edenton enjoyed an economic revival beginning in 1890 led by lumbering, an 1898 cotton mill, and a 1909 peanut-processing plant. Edenton is the home of the 1886 Roanoke River Lighthouse. The lighthouse is called a screw-pile design because of its original support system. Each piling was literally screwed into the river or sound bottom so they would not pull out in heavy storms and hurricanes. The Roanoke River Lighthouse, now located at Edenton, is believed to be the last extant example in the United States of a rectangular frame building built for a screw-pile base. The lighthouse was in commission from 1887 until 1941. Edenton is home to numerous early houses and public buildings, including the Cupola House. It was designated a National Historic Landmark in 1970, a designation also accorded the 1776 Chowan County Courthouse. The courthouse is still used for official court events. The city is home to the oldest house still in existence in North Carolina, constructed in 1719 before the establishment of the city. Edenton achieved international notoriety for the Little Rascals Day Care sexual abuse case, the subject of journalist Ofra Bikel's award-winning trilogy of documentaries: Innocence Lost (1991), Innocence Lost: The Verdict (1993), and Innocence Lost: The Plea (1997). Edenton is located in southern Chowan County at 36°3′43″N 76°36′21″W﻿ / ﻿36.06194°N 76.60583°W﻿ / 36.06194; -76.60583 (36.061855, −76.605766). It sits at the north end of Edenton Bay, just north of the confluence of the Chowan River and Roanoke River which forms Albemarle Sound. U.S. Route 17, a four-lane expressway, runs along the northern border of the town, with access from five exits. US 17 leads northeast 27 miles (43 km) to Elizabeth City and southwest 37 miles (60 km) to Williamston. Nags Head on the Outer Banks is 72 miles (116 km) to the east by road, and Raleigh, the state capital, is 136 miles (219 km) to the west. According to the United States Census Bureau, Edenton has a total area of 5.6 square miles (14.4 km2), of which 5.4 square miles (13.9 km2) is land and 0.19 square miles (0.5 km2), or 3.55%, is water. As of the census of 2000, there were 5,394 people, 1,983 households, and 1,294 families residing in the town. The population density was 1,076.3 people per square mile (415.7/km²). There were 2,204 housing units at an average density of 439.8 per square mile (169.9/km²). The racial makeup of the town was 42.86% White, 55.23% African American, 0.20% Native American, 0.63% Asian, 0.02% Pacific Islander, 0.44% from other races, and 0.61% from two or more races. Hispanic or Latino of any race were 1.45% of the population. There were 1,983 households out of which 30.0% had children under the age of 18 living with them, 38.0% were married couples living together, 24.7% had a female householder with no husband present, and 34.7% were non-families. 31.4% of all households were made up of individuals and 16.4% had someone living alone who was 65 years of age or older. The average household size was 2.37 and the average family size was 2.95. In the town, the population was spread out with 23.7% under the age of 18, 14.3% from 18 to 24, 21.3% from 25 to 44, 20.2% from 45 to 64, and 20.5% who were 65 years of age or older. The median age was 37 years. For every 100 females there were 78.2 males. For every 100 females age 18 and over, there were 71.4 males. The median income for a household in the town was $25,241, and the median income for a family was $34,132. Males had a median income of $27,192 versus $18,281 for females. The per capita income for the town was $13,264. About 20.3% of families and 25.1% of the population were below the poverty line, including 34.1% of those under age 18 and 20.1% of those age 65 or over. Located in northeastern North Carolina, Edenton is a small unique town known for its authentic 18th-, 19th- and early 20th-century architecture and the stories about the people behind these public buildings and homes. The Lane House dates from 1719 and may be the oldest house in the state of North Carolina. Edenton played a key role in the development of the colonies, the state and the nation. The Cupola House, a registered National Historic Landmark, was built by Francis Corbin in 1758 on the waterfront at Edenton where it stands today. The 1767 Chowan County Courthouse, another National Historic Landmark, has been used since its construction. The Barker House, home of Penelope Barker, the organizer of the first political action by women in the colonies, is operated as a house museum and to interpret colonial history. 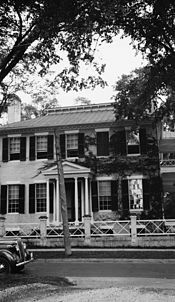 The home of James Iredell, Sr., is in Edenton and operated as a North Carolina Historic Site. For two years, 1951 and 1952, Edenton's Historic Hicks Field was home to a professional minor league baseball team. The Edenton Colonials played in the Class D Virginia League in 1951 and the Class D Coastal Plain League in 1952. Since 1998 Hicks Field has served as the home park for the Edenton Steamers of the collegiate summer Coastal Plain League. Harriet Jacobs (1813–1897), abolitionist and author of Incidents in the Life of a Slave Girl, published in 1861 under the nom de plume of "Linda Brent"
^ a b "Geographic Identifiers: 2010 Demographic Profile Data (G001): Edenton town, North Carolina". U.S. Census Bureau, American Factfinder. Retrieved December 30, 2014. ^ "Edenton & Chowan County". Retrieved 8 January 2010. ^ Byrd II, William (1728). The History of the Dividing Line Betwixt Virginia and North Carolina. p. 58. ^ Colihan, Jane. "At Home in Edenton" American Heritage, March 2004. ^ Ready, Milton (2005). The Tar Heel State: A History of North Carolina, p. 51. University of South Carolina Press. ISBN 1-57003-591-1. ^ Bishir, Catherine (2005). North Carolina Architecture. UNC Press. p. 51. ^ "Edenton Bell Battery". Edenton Historical Commission. Archived from the original on 26 July 2011. Retrieved 9 July 2009. ^ "Preservationists identify NC's oldest house". News & Observer. January 17, 2013. Archived from the original on January 20, 2013. Retrieved January 17, 2013. ^ "NOAA 1981-2010 Climate Normals". NOAA Regional Climate Centers. Retrieved 2018-01-11. ^ Holaday, Chris (1998). Professional Baseball in North Carolina: An Illustrated City-by-city History, 1901-1996. Jefferson, N.C.: McFarland. ISBN 978-0786425532. ^ "Hicks Field, home of the Edenton Steamers". ^ Who Was Who in America, Historical Volume, 1607-1896. Marquis Who's Who. 1967. ^ "Penelope Barker". National Women's History Museum. Retrieved 2017-07-11. ^ "NFL: Robert Brown". NFL.com. Retrieved 2017-07-11. ^ Hendricks, Martin (2012-02-09). "Robert Brown's stay was a long one". Milwaukee-Wisconsin Journal Sentinel. Retrieved 2017-07-11. ^ Cunningham, David (2013). Klansville, U.S.A.: The Rise and Fall of the Civil Rights-Era Ku Klux Klan. Oxford University Press. p. 115. ISBN 978-0199752027. This page was last edited on 8 September 2018, at 22:23 (UTC).